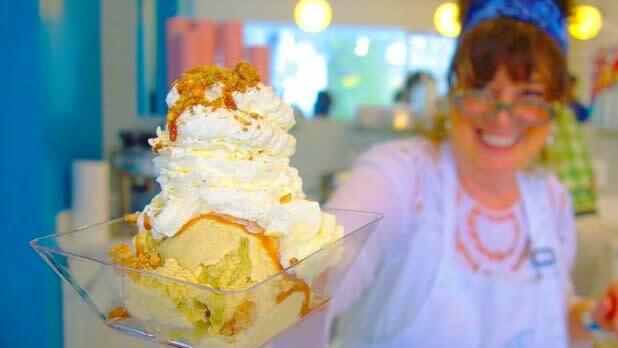 We all scream for ice cream—and New York State, where the ice cream sundae was invented, has some of the very best. From trendy artisan-run shops, featuring unique flavors you won’t find anywhere else, to classic roadside stands pumping out soft serve made from locally sourced ingredients, these are some of the best places to satisfy your cravings across New York, along with some things you might want to do in town when you’re not busy eating ice cream. Legend has it that the ice cream sundae was invented at Platt & Colt’s Pharmacy in Downtown Ithaca in 1892. 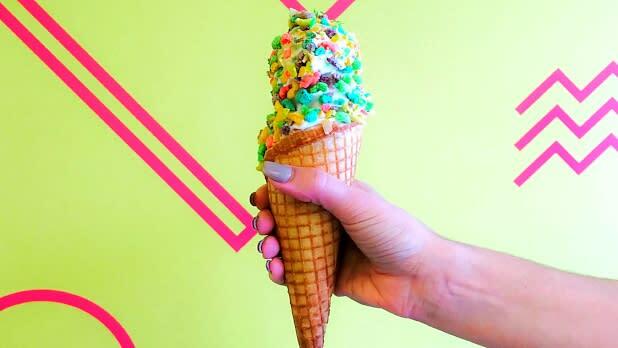 Though the pharmacy has since closed, you can get your fix at Purity Ice Cream, an 80-year-old parlor with a retro vibe, where you can choose from a plethora of options that even include soy-based ice creams and gluten-free cones. Ithaca Farmers Market: With more than 100 vendors, this weekend market is a must-see for foodies. Taughannock Falls State Park: Take an easy hike to a 215-foot waterfall. Keuka Lake Wine Trail: Try a different kind of flight at one (or more!) of the wineries along the trail. Belhurst Castle: Treat yourself to dinner or a spa treatment at a lakeside castle turned boutique hotel in nearby Geneva, NY. 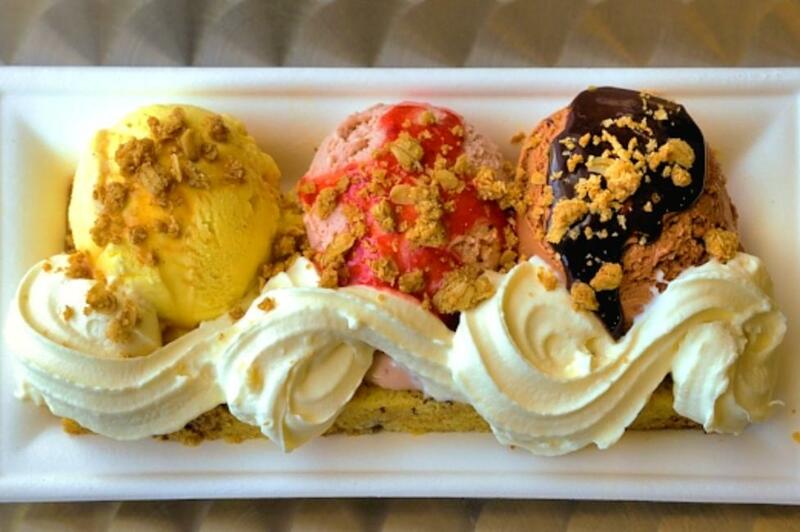 At Lake Effect, small-batch artisan ice cream is paired with locally crafted mix-ins (like chunks of fry cakes from Paula’s Donuts) to create out-of-this-world sundaes that’ll have you feeling the #Buffalove. The Lockport shop is located right above the historic Flight of Five lock system on the Erie Canal, so take your cone across the street for the perfect vantage point for watching the boats go by. Lockport Locks & Erie Canal Cruises: Take a scenic ride along the canal and learn about the history of this impressive waterway. Niagara Falls Cave of the Winds Tour: Get up-close and personal and check this natural wonder off your bucket list. Putting the rainbow in rainbow sprinkles since 2011, the Big Gay Ice Cream Shop serves some of the city’s best ice cream and everyone’s invited to the party. Get the “Salty Pimp” featuring vanilla soft serve, dipped in salt, injected with dulce de leche, and covered in a crunchy chocolate shell, and see why it was chosen for an episode of the Food Network’s “The Best Thing I Ever Ate,” or shake it up with a pick off the extensive milkshake menu. Explore Harlem: Take a tour of this historic Uptown neighborhood. If you’re around July 29–August 31, partake in the Harlem Week festivities. Brooklyn Bridge: Walk the Brooklyn Bridge for a stunning view of the Manhattan skyline and one of the city’s best selfie opportunities. Everything tastes better on a stick, and that certainly holds true for Zora Dora’s, which serves ice cream and sorbets in popsicle form. The downtown Beacon “popsicle gallery” features unique flavors like avocado and passion fruit/strawberry made with the freshest ingredients the Hudson Valley has to offer. An outpost stand at Walkway Over the Hudson offers stunning views of the Hudson River with your popsicle. Storm King Art Center: Explore one of the world’s leading sculpture parks. Walkway Loop Trail: Go beyond the walkway itself to explore downtown Poughkeepsie and hike the beautiful historic woodlands of Franny Reese State Park. 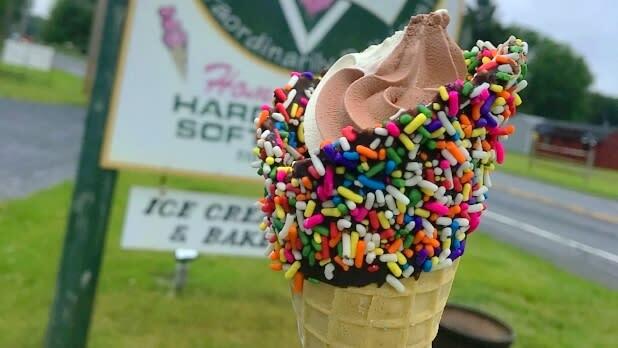 Named one of TripAdvisor’s Top 10 ice cream parlors in the U.S., Martha’s, along with its big rooster-topped neon sign, has been a Lake George landmark for over 50 years. 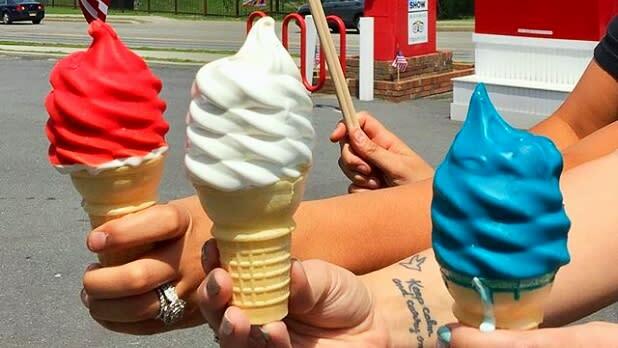 Crowds flock to this roadside stand for its generous cone sizes and rotation of 37 delicious flavors of homemade soft serve that change daily. Great Escape & Splashwater Kingdom: Offers thrilling rides for the whole family (and is conveniently located across the road). Minne-Ha-Ha: Go back in time and enjoy incredible views with a Lake George cruise aboard a historic steamboat. 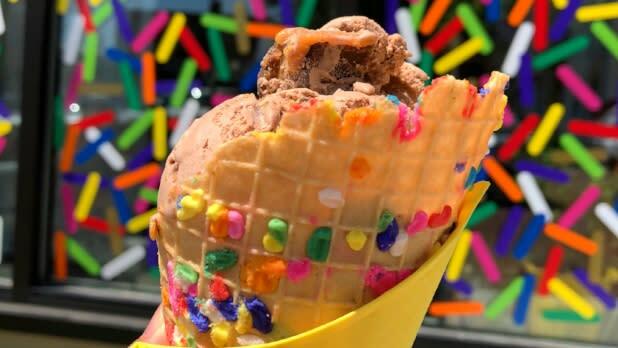 Nestled in a hip little block downtown, the Sprinkle Cone serves up unique flavors of locally made ice cream in freshly made waffle cones that have sprinkles pressed into them. Try staples like cake batter or salty caramel with peanuts, or ditch the cone and order a Thai tea float made with vanilla ice cream, Thai tea, and tapioca bubbles. The kiddos (and adults, tbh) will love playing with the chalkboard wall and selfie props, among other fun knick-knacks. National Comedy Center: The nation’s one and only museum completely dedicated to the art of comedy opened its doors on August 1. Panama Rocks Scenic Park: Take a half-mile-long scenic hike through an ancient forest featuring rock formations, 60-foot-high crevices, and caves. 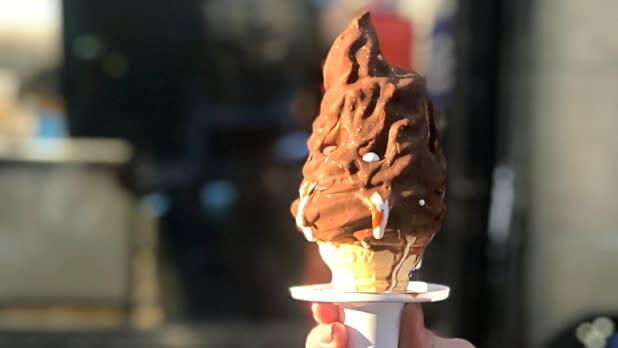 Located inside a cute Adirondack-style log cabin, the Ice Cream Man is known for its hard and soft serve custard made on-site from locally sourced dairy. You’ll find a selection of daily favorites like Orange Pineapple and Almond Joy complemented by an additional batch of exotic flavors that are announced almost daily on the shop’s Facebook page. Over the years, the team behind the Ice Cream Man has handcrafted more than 300 custom recipes, a batch at a time. 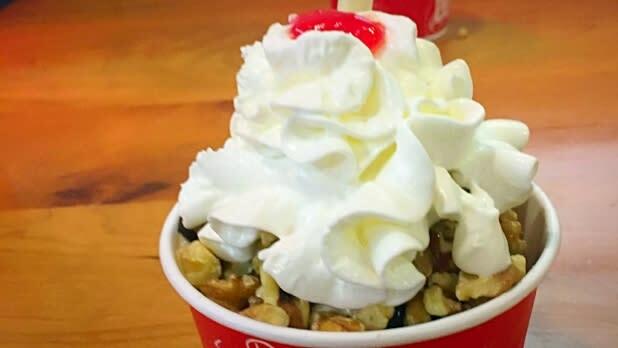 Don&apos;t leave without trying the sundae that was good enough to challenge Bobby Flay on the Food Network show “Throwdown with Bobby Flay”—warm apples, nuts, and whipped cream are piled atop vanilla ice cream and, of course, crowned with a cherry on a top. Saratoga Performing Arts Center: Take in an outdoor concert at one of the state’s premier performance venues. Roosevelt Baths & Spa: Treat yourself to a hydrotherapy spa experience featuring the naturally effervescent waters that brought Saratoga Springs its fame. This local favorite makes all of their ice cream in-house from grass-fed Ithaca milk and local ingredients—the coffee flavor, for example, is made with Buffalo-bred Tipico Coffee. You won’t find any artificial flavors or colorings here, but you will find creative toppings and even a vegan option. Skip the cherry and top your sundae with a fresh churro. Buffalo RiverWorks: Soar through Buffalo on a new zip line or scale a climbing wall inside a converted grain silo. Canalside: Get out on the water or enjoy a live concert harborside. Move over, groundhog! In Central NY, the arrival of spring is marked by the season’s opening of Humdinger’s ice cream shop—usually around St. Patrick’s Day. Humdinger’s homemade ice cream has been drawing lines for more than 60 years thanks to more than 50 hard ice cream flavors and signature soft-serve swirls. Animal Adventure Park: Visit social media sensation April the Giraffe and her furry friends. With almost all ingredients coming from local farms and purveyors in the Catskills, Nancy’s offers a true farm-to-cone experience. Old-fashioned favorites are scooped into cones, cups, and sundaes, but are also available as beautiful ice cream cakes drizzled with hot fudge and caramel. Woodstock Farm Animal Sanctuary: Take a tour and meet hundreds of rescued farm animals. Overlook Mountain: Hike up a mountain path that takes you past the ruins of an abandoned hotel and all the way up to a fire tower where you’ll be rewarded with stunning 360-degree views of the Catskill Mountains. 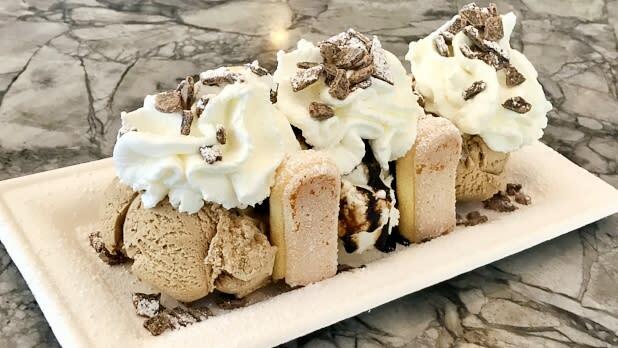 There’s something magical indeed about this old-fashioned ice cream shop serving up thoroughly modern concoctions like kulfi and hazelnut biscotti. Make a meal of it with one of the shop’s “Magic Wonders,” like the very Insta-worthy banana split. Harbes Family Farm: Take the kids on a farmyard adventure complete with a singing hayride tour, pig races, a gnome hedge maze, a petting zoo, and so much more. Long Island Aquarium: Enjoy sea lion shows, meet African Penguins, pet a ray, or go on a shark dive inside the 120,000-gallon Lost City of Atlantis exhibit. 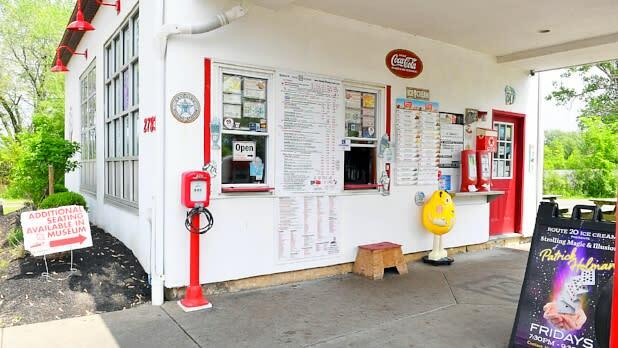 Route 20 is not just one of the tastiest places in New York State to stop for a cone, but it’s also one of its most photogenic. 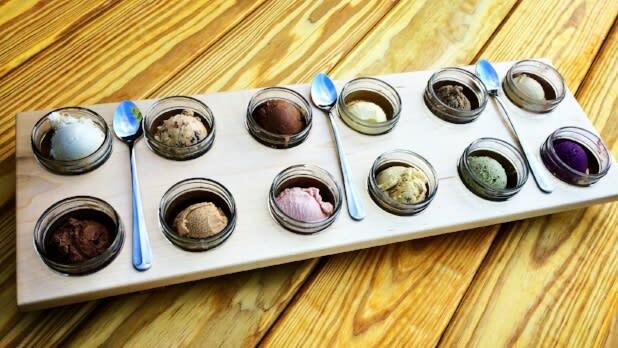 Housed in a vintage gas station that also doubles as a museum dedicated to all things nostalgia, this scoop shop serves every type of frozen treat imaginable, including protein shakes for the diet-conscious and a “Doggie Dish” filled with vanilla ice cream and doggie treat sprinkles for your furry pals. Kids will love the free entertainment featuring a magician who comes around on Friday evenings between 7:30 and 9:30 pm. 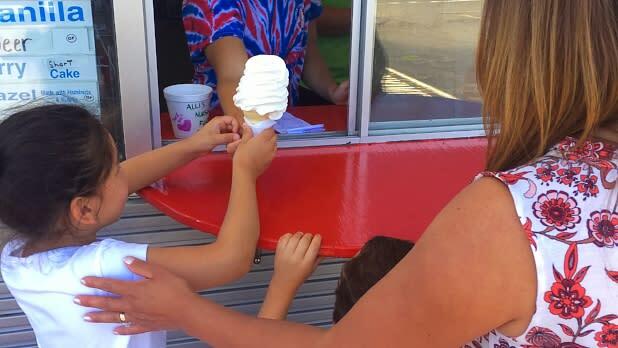 Not one to leave out mom and dad, Route 20 celebrates these everyday heroes by giving parents a free small cone of ice cream every Mother’s and Father’s Day. New Era Field: Permanent home of the Buffalo Bills and temporary host to concerts by top acts. Darien Lake Amusement Park: World-class roller coasters and the region’s largest waterpark provide plenty of fun for kids of all ages.